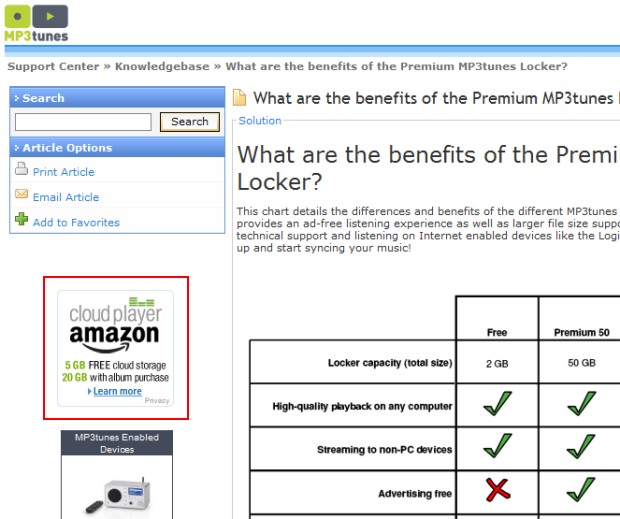 Will Amazon Drive Music Lockers Like MP3Tunes And mSpot Beyond Oblivion? Make no mistake about it: the digital music space will be turned upside down this year, courtesy of giants like Apple, Google, HP, Sony and now, Amazon. Earlier today, the latter announced that it was entering the world of digital music locker services with a bang, introducing services dubbed Cloud Drive and Cloud Player that basically let you store your digital music – and more – in the cloud and stream it from browsers on any computer as well as from Android phones. A lot of the virtual ink that’s already been spilled on the unveiling of those services has understandably focused on the battle between the giants cited above, but I can’t help but wonder how this will impact the many startups in the space, namely the likes of mSpot, MP3Tunes, Maestro.fm, Orb, MiMedia and Audiogalaxy (not to mention the yet-to-launch Beyond Oblivion, which has raised close to $90 million from News Corp and others). I decidedly left out companies offering digital music subscription and discovery services such as Rdio, MOG, Pandora, Spotify and Grooveshark, because I think that’s a different ballgame. Just looking at storage prices for the two better known startups in the music locker space, MP3Tunes and mSpot, I seriously doubt anyone will still find those appealing when you put their offering next to that of Amazon and its Cloud Drive. In other words, as soon as you need way more than 20 GB, you just might still be better off sticking with the startups than making the switch to Amazon Cloud Drive, but how many people genuinely need more than that for storing digital files (Amazon points out 20 GB comes down to about 4,000 songs and 8,000 photos already)? And even if 5 GB worth of free storage doesn’t cut it for you, remember that MP3Tunes only offers 2 GB of free storage if you put up with advertising. Also, at least for now, upgrading to 20 GB of storage on Amazon’s Cloud Drive costs you about $3.99 for a whole year if you just buy a cheap album from Amazon’s MP3 store, while it will cost you about five times as much to get that kind of storage on MP3Tunes (and about the same price on mSpot if you’d cut their price for 40 GB in half). On a side note: amusingly, MP3Tunes currently even advertises the lower pricing of its new rival on its own website (see screenshot below). To conclude, with this pricing scheme Amazon has made it extremely difficult for MP3Tunes and mSpot to compete with them. Also consider that Amazon has a lot of brand leverage, a wealth of cloud infrastructure expertise and a potentially huge user base from the get-go (courtesy of its popular MP3 store, which is second in the US only to Apple’s iTunes) . Sure, music store on Amazon’s Cloud Drive can not be played on iOS devices at this point, but as MG Siegler points out there’s already a work-around for that. Amazon just beat Google and Apple to market with its music locker service (which, again, also works for documents, videos and photos) but has it also priced music locker startups squarely out of that market at the same time? I’ve asked mSpot and MP3Tunes for comment but haven’t heard back yet. Update.